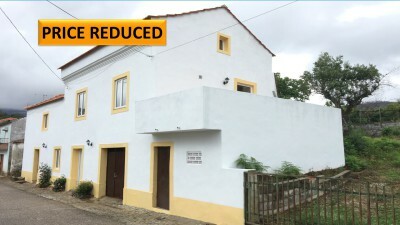 This newly restored house is situated in the pretty village of Campelo, 10 minutes from the small town of Castanheira de Pera. There is a restaurant/bar, a post office & a community centre all within 2 minutes walk. The ground floor comprises of a large garage and two separate storage rooms with stone walls and high ceilings. These rooms would be suitable for development to provide further accommodation if required. Stairs from the front door lead up to a small landing. To the left is bedroom 2 with views over the valley, a pine wooden ceiling and a small niche with an original beam above. To the right is the large open plan lounge/kitchen/diner with lovely exposed stone walls and views over the valley. There is a tall storage cupboard with electricity supply, fuse box and digital/key operated safe. Off the kitchen is a tiled patio area for alfresco dining. The main bathroom and utility room are also on this level. A modern style staircase leads up to the master bedroom and en suite. The large plot of land opposite has a southerly aspect and is split into 2 areas. The top terrace has an old brick built animal/storage shed with electricity. This would be a lovely space for a swimming pool, summer kitchen and relaxing garden. The owners were advised by the local council that planning permission for a dwelling would also be possible. All newly insulated roofs, 16 made to measure double glazed windows & doors. Wooden floors & ceilings. All new electrics and where possible LED lights. Some sockets have phone charging outlets. New plumbing from the meter to the main drain out. The large master bedroom has a vaulted pine ceiling and a pine floor. The en suite comprises of a shower, wc, vanity unit with mirror and an electric towel rail. The skylight floods the room with light. Newly fitted kitchen with electric oven, ceramic hob, extractor fan, fridge/freezer, sink with mixer tap, low level lighting under the units and concealed lights in the ceiling. Main bathroom has a full size bath with shower attachment, separate double headed shower, vanity unit with mirror, wc and electric towel rail. The utility room has provision for a washing machine and tumble dryer. There is a lovely walled patio area off the kitchen for al fresco dining. Castanheira de Pera (10 minutes) and Figueiro dos Vinhos (25 minutes) have all essential amenities including banks, supermarkets, health centres, schools, cafes and restaurants. In Castanheira de Pera you will also find Praia de Rocas, a man made lido with a beach, wave machines, pedalos etc. The beautiful city of Coimbra (40 minutes) has a large university, botanical gardens, museums, boat trips on the river and pretty cobbled streets with quaint shops and restaurants/cafes/bars.